On my last full day, I woke up, broke camp, and attempted to have a Mountain House dehydrated meal of bacon and eggs for breakfast. I don’t know if I did it wrong, or if it’s just a bad one (most of their other ones are really good), but it was terrible. I threw half of it out, and went to Eklecticafe for some breakfast (and more coffee) instead. From there, I was headed for a ride before things got too hot. By looking at MTBProject, I’d come across the KlonZo set of trails, and decided that they were a good spot for me to go for a ride, right near Arches NP. 4wd is required to get in there, just because it’s sandy more than anything. No problem for the Ranger, and I got to the trailhead by some time around 9am. When I got there, I decided to do Borderline to Cross Canyon, Verti Go, Secret Passage to Dunestone and end up back at the parking lot. I’m not exactly sure how long that ended up being, but it was a nice little ride. It was hot out there already, so I was happy (and sweaty) to be done by the end of it. Lots of swoopy single trail, and a bit of decent technical stuff, including a whole section where you’re riding over solid rock (with the trail painted/marked directly on the rocks). Pretty awesome overall. After my ride, it was time to hit Arches National Park, the main reason I was in Utah. There was a really long line to get in the front gate, but luckily my America The Beautiful pass sped things up for me a bit. Once inside, I did a full loop and checked out a bunch of the arches. Between the arches themselves, and the towering pinnacles of deep, red, rocks, Arches was really stunning. It’s like another world there, especially when compared to to my ride that very morning. Once I was done with the hike at the end of the Arches loop, I decided to head towards home. I drove back up the Highway 128 Scenic Byway (which is absolutely stunning… until it turns into brown, flat, boringness) and through the creepy ghost town of Cisco. I wanted to find somewhere before Denver to camp the night, since I definitely didn’t want to drive all the way home after what was already a pretty long day. The Perseid Meteor shower was also supposed to be at its peak on this night, so it was a perfect chance to get a great view of it. It turned out that my destination was pretty close — Colorado National Monument. Up at the “top” of the park (the top of the mesa, overlooking the canyon), I dropped into the Visitor’s Center, and found out that you can back country camp there (for free). I filled out the paperwork, packed my gear, and headed off to find a good spot to camp for the night. In the morning I was up and out of there, back down through the rest of the National Monument, and then the long, boring drive home along I70. That was the end of this journey, thanks for reading along. Day Five started with a bit of a sleep-in compared to previous days. I was up and packed up pretty quickly (wanted to avoid any more rain), but was only moving by just after 8am. With some hustle, I was down to the trailhead just before 10am, and immediately cooking up some breakfast (re-heating yesterday morning’s leftovers, which spent the night wrapped tightly in foil, in the toolbox of the truck). After filling up on food (and coffee), it was time to rumble back down the county road and get back on the highway. Another mountain pass, and I was headed over to Telluride. The plan had been to camp the night at Alta Lakes, but with rain hammering down as I entered Telluride, and the prospect of another wet night confronting me, I decided to just stay the night in town, and get a hot shower while I could. That gave me more time to explore and get out for a ride as well, so a shower would be very welcome after that. I grabbed lunch at Smuggler’s, an apartment at The Fall Line Condos, and enjoyed a shower after the sweaty hikes up and back from Blue Lake. With most of the afternoon left, I decided that a good ride was definitely in order, so I took the (free!) gondola up to the ski area, and headed out on Prospect Trail, following along via the MTBProject app on my phone. What a ride! It had some climb, a bunch of downhill, loads of mud, and a bunch of pretty swoopy twists and turns. It was great. There were some areas that were rutted and rocky because of the recent rains, but it was still awesome. There were even a couple of creek-crossings, which were extra fun on the fatbike. After that muddy ride, I was in need of another shower (and so was my bike!). I cleaned up, and then spent the evening strolling around town, doing a little shopping, and getting more food. I ended the day watching some of the Olympics from my room, and then passed out pretty early. Since check-out from the hostel I was staying in the night before was 10am, I figured I could get in a morning ride, and still be back in time to have one last shower. Turns out it was lucky I could get that shower, because the ride was a sweaty one, with lots of climbing involved. The views were amazing though, so it was all worth it. I rode around in amongst the Lower Loop and Lupine trails, which start (and end) right in town. Super convenient. With the ride done, and all cleaned up and checked out, I grabbed some coffee and breakfast, and hit the road for Cimarron. I was kind of expecting to get lunch there, but this was another case of underestimating a small “town”, and in fact Cimarron is not even really that. There’s a general store there, but otherwise it’s basically just a campground, and then a huge dam. I hadn’t actually realized there was such an impressive dam (Morrow Point Lake/Reservoir), but it turned out to be a great spot for a little hike, and a little fishing. I didn’t catch anything (even though I watched a young guy catch and gut 4 or 5 trout right in front of me! ), but it was a nice break from driving regardless. From Cimarron I powered through to Montrose, where I stopped at Horsefly Brewing Co for lunch and a pint. Then it was back out to Black Canyon of the Gunnison National Park to find my campsite and check things out. My site was pretty mediocre (next to an RV, no trees or anything really), but I booked it pretty last minute, so I was just happy to get it. The canyon, on the other hand, was incredible. I drove out to the end of the outlook road, and then hiked the Warner Point Nature Trail. From there I worked my way back through some of the lookouts. I liked Dragon Lookout the best (amazing view down the canyon, and of the “Painted Wall” with the “dragons” on it). On my last stop I met a recent college grad who was on an absolutely epic (and crazy) roadtrip that had already been going for a month. He was stopping all over the place, but driving hours and hours and hours a day, so he’d covered half of Canada and the US, and had done something like 10,000 miles already. Luckily I had stopped in at the Visitor Center, so I knew there was a night time session at the amphitheater that night, which I went and checked out. “Ranger Molly” put on a great session about the nightlife and stars and whatnot at Black Canyon, which was quite fun. From there I went back to my campsite, and was lucky enough to watch two different lightning storms off in the distance (in 2 different directions), without either of them bringing bad weather my way. The stars were stunning, and with very little light pollution in Black Canyon, extremely bright. 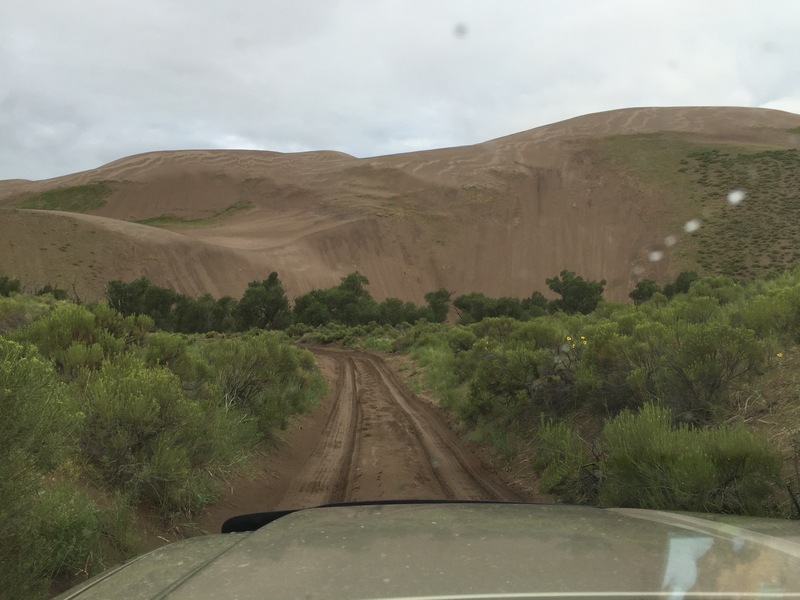 On the first day of the trip, I wanted to head south through Deckers to go fishing, and then get down to Great Sand Dunes National Park and Preserve. The fishing in Deckers turned out not to be too great (and it was drizzling), but it was beautiful nonetheless. The water was also a lot colder than I expected, so I really should have brought my waders/boots so that I could have gotten out there properly. From there, I took 67 and 24 down to Colorado Springs, and then I25 all the way down to Walsenburg. I was going to grab something “local”, but things seemed to be pretty shut/quiet, and I ended up just grabbing a burger at Carl’s Jr (barf) before heading out again. Heading west on 160 (some beautiful scenery along here), and then north on 150 took me to the Great Sand Dunes, which were super impressive. This is where I picked up my “America The Beautiful” pass, so now I have no excuse not to get out to more parks/forests etc. 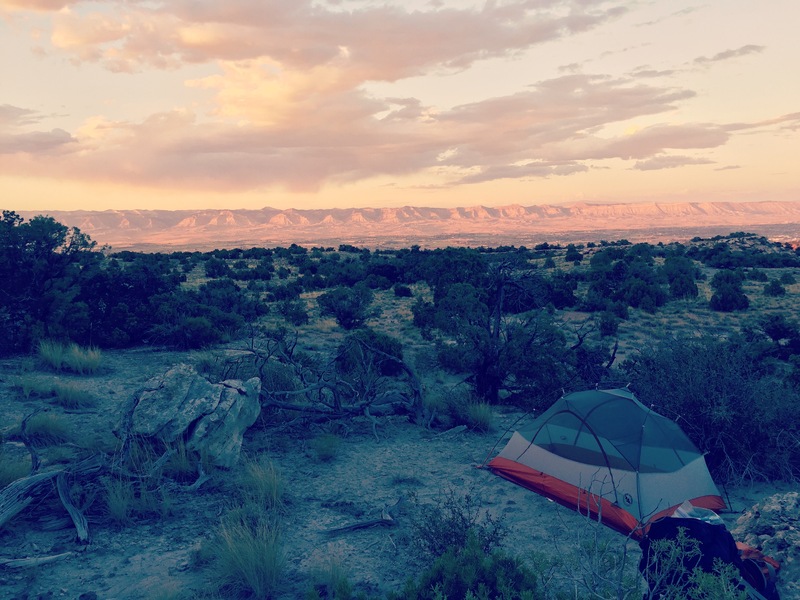 I had originally planned to hike in the afternoon, and then camp at Zapata Falls Campground, which is a few miles outside of the dunes. When I talked to the rangers at the park though, they suggested that since I had a high-clearance 4WD (yay new Ranger! ), I should head up Medano Pass Primitive Road a bit, where there are a bunch of first-come-first-serves campsites. I got there later than planned, so I was going to be hiking the dunes in the morning anyway, so this made a lot more sense (coming back that way already). To be honest I was a bit nervous about heading up this road, because I’d read a little about it, and it sounded like some pretty serious 4WD-ing. I hadn’t even turned the knob to make sure the 4WD worked on the Ranger, and definitely hadn’t taken it off-road. I was also driving alone, and didn’t feel super prepared for if things got ugly (no winch, no high-jack, etc etc). But… YOLO. So I headed off, and it turned out to be relatively fine; some good mud, some sand, a couple of small creek crossings and I was into my campsite (site #0, right after you technically leave the park, just over 5 miles in on the road). I initially grabbed a campsite a little further up the road, but after fatbiking up and down to the next creek crossing, I decided to come back to the the very first one, which was more protected and looked nicer. It was a pretty awesome campsite, although it had been raining pretty heavily (and continued drizzling) there, so everything was wet. Getting a fire going was pretty tedious and involved a lot of stoking and blowing. Eventually I got something to hold a flame though (albeit with a bunch of smoke), which gave me something to do in the dusk hours.